The Duke and Duchess of Cambridge have released three official Christmas photographs of Prince George. The pictures were taken in late November and show the prince in a courtyard at Kensington Palace. 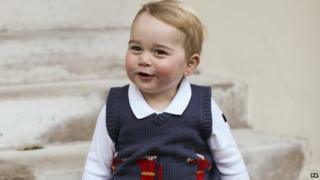 The third-in-line to the throne celebrated his first birthday in July, and is now almost 17 months old. The shots of the prince were taken by Prince Harry's private secretary Ed Lane Fox, who has also worked as a freelance photographer. Prince William and his wife Catherine are releasing the images, in part as a thank you to the media, who have not published any of the paparazzi pictures that have been taken of the prince, BBC royal correspondent Peter Hunt said. The couple are said to be grateful that their request for their son to grow up without intrusion continues to be honoured, our correspondent added. The Duke and Duchess of Cambridge have recently returned from a three-day tour of the east coast of the United States during which they visited the 9/11 memorial and museum, met President Obama and watched a basketball game. The couple announced in September the Duchess of Cambridge was pregnant with their second child. The duchess has already signalled that she will not be accompanying her husband when he visits Japan and China in early 2015, as she will be heavily pregnant. Prince William will spend three days in each country during his trip in February and March, visiting both capital cities.